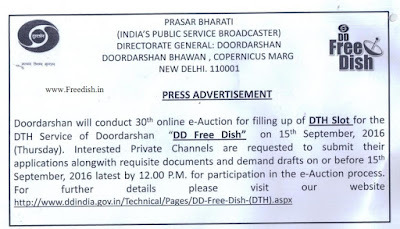 Doordarshan Prasar Bharati going to conduct 30th online e-auction for filling up of DTH slot for the DD Freedish free DTH service of Doordarshan on 15th September, 2016 (Thursday). 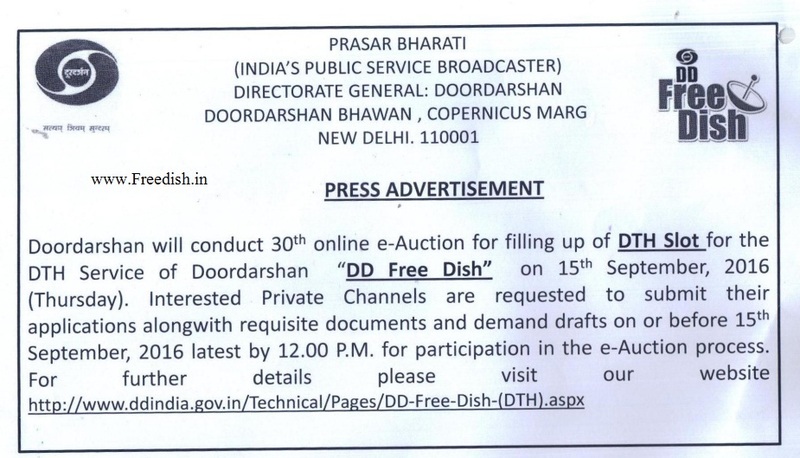 Interested Private TV Channels are requested by Doordarshan to submit their applications along with requisite documents and demand drafts on or before 15th September 2016 latest by 12:00 PM for participation in the e-Auction process. Prasar Bharati set the reserve price for per DTH slot is Rs.4.30 Crores, and this e-Auction process will be completed by M/s C1 India Pvt. Limited, Gurgaon. All the interested TV channels require submitting up-linking and Down-linking permission from the Ministry of I&B along with the Application. Participation amount is Rs.1.50 Crore only, demand draft in favour of PB (BCI) Doordarshan Commercial Service, New Delhi. Processing fee Rs.10,000/- is non-refundable which will be pay demand draft in favour of PB (BCI) Doordarshan Commercial Service.